Mail Order Manager Export addon designed to allow store owners to export orders from X-cart to Mail Order Manager software by Dydacomp.Orders can be exported to .dbf file that can be imported in M.O.M. using Order Export module. Export procedures are highly customizable, you can use filters to export orders filtered by some criteria.Import can be used to update order statuses as well as to create new orders at your store. ...... dbf file created by M.O.M. order export. How to use Mail Order Manager Export for X-Cart? 1. First step you should select operation you want to perform. Lets start with Export procedure. 2. 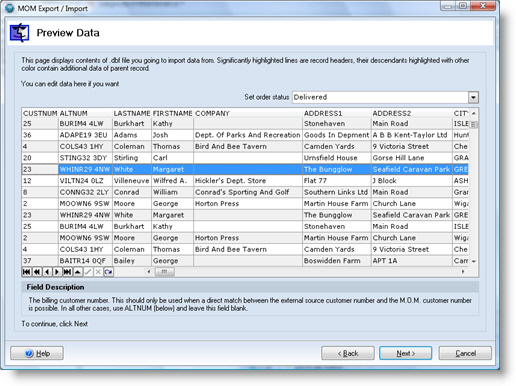 Select name of the file you want to export orders data to. Also you can select one of previously saved export configurations. 3. Next page allows you to create links between MOM's shipping methods and shipping methods defined in your store. MOM uses shipping method codes - left column. Right column shows shipping methods available at your store. MailList Manager is a tool for organize your emails lists. A Windows application for quick and effective management of X-Cart store. Webmaster tool allowing form data to be submitted to (several) email addresses. Qweas is providing links to Mail Order Manager Export for X-Cart 2.1.5.580 as a courtesy, and makes no representations regarding Mail Order Manager Export for X-Cart or any other applications or any information related thereto. Any questions, complaints or claims regarding this application Mail Order Manager Export for X-Cart 2.1.5.580 must be directed to the appropriate software vendor. You may click the publisher link of Mail Order Manager Export for X-Cart on the top of this page to get more details about the vendor.